Homesteaders chose this heavily wooded area for their home in 1869. From their humble log dwellings, the whistle of the train was to be heard just twelve years later in 1881. 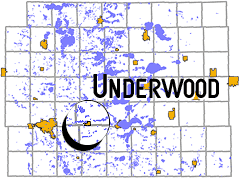 This was the beginning of a very busy little town, which we know today as Underwood. The railroad was petitioned to change the name from Southvick and the post office was also petitioned to change their name from Turtle Lake Post Office-all to Underwood in honor of Mr. Adoniram Judson Underwood, editor of the Weekly Journal at Fergus Falls, someone known personally by nearly every settler at that time, and a man of vast knowledge in the history of Otter Tail County, MN. He came to Minnesota in 1854; served in the First Minnesota and other regiments in the civil war; was a representative in the legislature, 1871-72; settled at Fergus Falls in 1873, and was the founder and editor of the Journal, 1873-85.